U.S. 202 | RT. 309 TO JOHNSON HWY. Copyright © 2017, GVFTMA. All rights reserved. This project consists of widening and reconstructing 9.1 miles of S.R. 202 by adding travel lanes in each direction between Johnson Highway in Norristown Borough and Route 309 in Montgomery Township: two lanes northbound and one lane southbound and a center turn lane from Johnson Highway to Swede Road. North of Swede Rd. to Route 309, two through lanes in each direction and a center turn lane, with the center turn lane eliminated in sensitive areas with minimal access needs. The project also includes a five-foot bicycle lane adjacent to the curb, sidewalk improvements, the reconstruction of bridges and culverts, construction of sound walls and retaining walls, intersections improvements, new traffic signals, signal interconnect, and offline improvements. Intelligent Transportation System (ITS) which consists of video cameras/detection and dynamic message signs (DMS) are also incorporated. This is a 1.8 mile section from south of Johnson Highway at the Norristown Borough/East Norriton Township dividing line to Township Line Road at the East Norriton Township/Whitpain Township dividing line. The project falls within Norristown Borough, East Norriton Township and Whitpain Township. Typically, the roadway will be reconstructed and widened from two lanes to provide a four lane cross-section consisting of two travel lanes northbound, a center turn lane and one travel lane southbound. Five-foot bicycle lanes will be provided both northbound and southbound. Sidewalks will be provided at various locations throughout the corridor. Intersections along the corridor will be improved by adding lanes where necessary on both the mainline and side roads to provide adequate intersection capacities. New traffic signals will be installed at five intersections including Johnson Highway, Jefferson Crossing Boulevard, Northtowne Shopping Center, Northtowne Plaza/Mercy Suburban Hospital Driveway and Germantown Pike. Traffic signals will be interconnected to improve traffic flow between intersections. A coordinated ITS and traffic signal operating system will be integrated into the project. A dynamic message sign will be installed at northbound S.R. 202 south of Germantown Pike. One box culvert at the Jefferson Crossing Driveway and a bridge north of Germantown Pike will be replaced as a part of the project. Stormwater management facilities will be installed and the drainage system will be replaced along the corridor. Two noisewalls are planned for the project, one is proposed along southbound S.R. 202 south of Township Line Road at the Washington Square neighborhood, and one is proposed along eastbound Johnson Highway west of S.R. 202 (DeKalb Pike) at the Joseph Drive neighborhood. One retaining wall is proposed at the northwest corner of the S.R 202/Germantown Pike intersection. Both aerial and underground utilities will be relocated as necessary throughout the corridor and sideroads. Construction bids are expected to be opened in early 2019. This is a 2.5-mile section from Township Line Road at the East Norriton Township/Whitpain Township dividing line to just south of Morris Road within Whitpain Township. The project falls within East Norriton Township and Whitpain Township. Typically, the roadway will be reconstructed and widened from two lanes to five lanes, consisting of two northbound lanes, a center turn lane and two southbound lanes. Five-foot bicycle lanes will be provided both northbound and southbound. Sidewalks will be provided at various locations throughout the corridor. Intersections along the corridor will be improved by adding lanes where necessary on both the mainline and side roads to provide adequate intersection capacities. New traffic signals will be installed at seven intersections, including Township Line Road, Swede Road, Yost Road, Jolly Road, Skippack Pike, Village Square Shopping Center Driveway and Montgomery County Community College/Tournament Drive. Traffic signals will be interconnected to improve traffic flow between intersections. A coordinated ITS and traffic signal operating system will be integrated into the project. Dynamic message signs will be installed along S.R. 202 northbound and southbound at the bridge over the Pennsylvania Turnpike’s Northeast Extension. Five box culverts will be replaced, including those adjacent to the S.R. 202/Skippack Pike intersection and one on S.R. 202 between the Village Square Shopping Center and the Montgomery County Community College. Stormwater management facilities will be installed and the drainage system will be replaced along the corridor. One noisewall is proposed along northbound S.R. 202, south of Jolly Road. Two retaining walls are proposed as part of the project: one retaining wall is along northbound S.R. 202 north of Township Line Road and one retaining wall is along northbound S.R. 202 north of Skippack Pike. Both aerial and underground utilities will be relocated as necessary throughout the corridor and sideroads. The bridge crossing over the Pennsylvania Turnpike’s Northeast Extension (I-476) was reconstructed by the Pennsylvania Turnpike Commission in 2010 and will remain. As a part of this project, the Section 600 Wetland Mitigation Site will be constructed near the intersection of Butler Pike and Morris Road in Upper Dublin Township. A portion of a breached dam on the Wissahickon Creek near the intersection of Butler Pike and Morris Road in Upper Dublin Township will be removed for Section 600 stream mitigation. Construction bids are expected to be opened in mid-2018. This is a 2.7 mile section from south of Morris Road to near Hancock Road. The existing roadway will be widened to provide a five lane cross-section consisting of two travel lanes and a common center turn lane. A short section of the roadway from Grasshopper Lane to Schoolhouse Road will be reconstructed with four travel lanes and 8 foot shoulders. The inclusion of five foot bike lanes in each direction along the entire section is also proposed. The project includes intersection improvements at Morris Rd., Sumneytown Pk., Swedesford Rd. and Plymouth Road. Traffic signal improvements will occur at four (4) intersections including: Morris Road, Township Line Road, Schoolhouse Lane, and Sumneytown Pike. The project includes replacement of the existing bridge at Wissahickon Creek with a wider single-span structure. 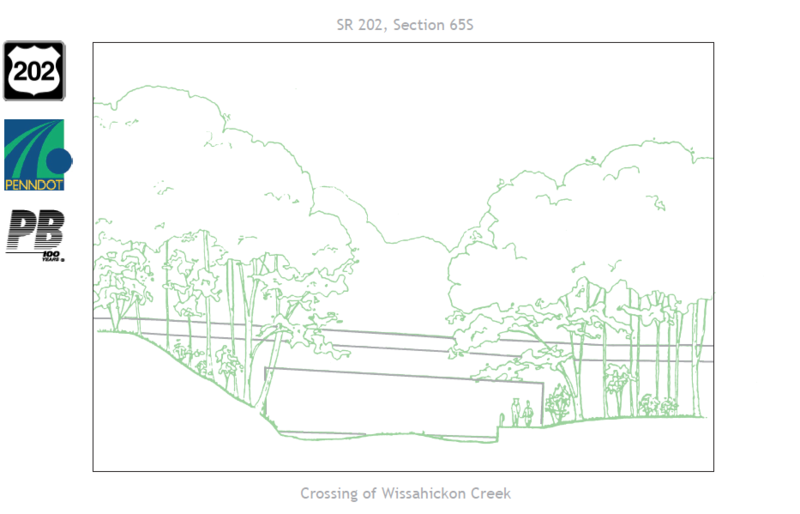 Three (3) retaining wall installations are planned as part of the project with two (2) wall located adjacent to the Wissahickon Bridge. No culvert installations are planned as part of the reconstruction however; drainage pipe will be installed along and across the roadway. Two (2) noise wall installations are planned along the roadway. A coordinated ITS and traffic signal operating system will be integrated into the project. Construction bids are expected to be opened in early 2019. This 2.1-mile section from south of Hancock Road to near Bethlehem Pike (PA 309) and a 0.8-mile section of Welsh Road (PA 63) was completed in the fall of 2013. The project involved the widening of S. R. 0202 (DeKalb Pike) from south of Hancock Road to Knapp Road, the widening of S.R. 0063 (Welsh Road) from Stump Road (T-375) to 800 feet east of Bell Run Boulevard (T-526), and construction of a new four lane urban arterial that connected the proposed S.R. 0202 Section 700 Parkway. Also as part of this project, Swedesford Road (T-375) was realigned and connected to Gwynedd View Road (T-415). Swedesford Road no longer connects to S.R. 0063, but terminates with a cul-de-sac adjacent to S.R. 0063. Both S.R. 0202 and S.R. 0063 are four lane urban arterials, each with 5-foot curbed bike lanes adjacent to the outside travel lane. S.R. 0202 has a center-turn lane from just south of Hancock Road to just south of Gwynmont Drive. S.R. 0063 has a center left turn lane west of S.R. 6202. Signal improvements were installed at four (4) intersections along S.R. 0202 including: Hancock Road, Welsh Road (S.R. 0063), Knapp Road and Montgomery Mall Driveway; as well as the intersection of S.R. 0063 with Stump Road (T-375). Two (2) new signals were installed at the intersection of S.R. 0063 with S.R. 6202 and at the intersection of S.R. 0202 with S.R. 6202. No bridge, culvert or retaining wall structure installations occurred as part of the project. Three (3) noise wall installations were completed as part of the project. A coordinated ITS and traffic signal operating system was also integrated into the project. This project consisted of the relocation of the Meetinghouse Road intersection with S.R. 0202 (Dekalb Pike) and five (5) offline intersection improvements along S.R. 2016 (Evans Road); including: roadway and shoulder reconstruction as part of the installation of a left turn lane along approximately 1.019 miles of .S.R. 0202 (Dekalb Pike) at the relocated Meetinghouse Road intersection; sight distance improvements at two intersections along S.R. 2016 (Evans Road); a new traffic signal installation, left turn lane construction, installation of new curbing, drainage improvements, milling and overlay at the S.R. 2016 (Evans Road) intersection with Sumneytown Pike; new shoulder construction, pavement markings, resurfacing and drainage improvements at the S.R. 2016 (Evans Road) intersection with Tanglewood Drive; and, construction of a new right turn lane, new curbing, drainage improvements, milling and overlay at the S.R. 2016 (Evans Road) intersection with S.R. 0063 (Welsh Road). This project was completed in the spring of 2012. This project includes improvements to intersections along Township Line Road (S.R. 3001) which were previously part of the S.R. 202, Section 61N project but will be advanced as a separate project (S.R. 3001, Section OFF). Improvements at the intersections of North Wales Road/Township Line Road and Arch Road/Township Line Road will be made to improve traffic flow through the area during construction of S.R. 202, Sections 61N and 61S projects. The improvements at these intersections will remain after the construction of the S.R. 202 Sections 61N and 61S projects are completed. At the intersection of North Wales Road and Township Line Road, the southern intersection leg will be widened to extend the left turn lane and improve traffic flow. Township Line Road will be widened to provide left turn lanes in both westbound and eastbound directions. The traffic signal equipment will be replaced. At the intersection of Arch Road and Township Line Road, the legs of the intersection will be widened to improve traffic flow. Arch Road will be widened to provide left turn lanes on both the northbound and southbound legs. The eastbound leg of Township Line Road will be widened to provide a right turn lane. Both the eastbound and westbound legs of Township Line Road will be widened to provide proper lane shifts. The traffic signal equipment will be replaced. Additional improvements include replacement of the drainage system, signing, and pavement markings, as well as installation of ADA compliant curb ramps at both intersections. Construction bids are expected to be opened in late 2017. This project includes the installation of stormwater management mitigation facilities on Whitpain Township property located at the southeast corner of the Skippack Pike/Wentz Road intersection. The improvements will mitigate stormwater runoff upstream from the S.R. 202, Section 61N project. The project will incorporate a planned intersection realignment so the design of the two improvements can be coordinated. Wentz Road will be realigned to connect with Parkwood Road to improve traffic flow. The traffic signal equipment will be replaced. Additional improvements include replacement of the drainage system, signing, and pavement markings, as well as installation of ADA compliant curb ramps at the intersection. Construction bids are expected to be opened in late 2018.